Update April 23, 2017: I’m afraid the Read Dead Redemption map mod for GTA V is no more. Posted on GTAForums yesterday, member of the .White development team Mr. Leisurewear announced that the mod has officially been cancelled. If you still need that sandbox itch scratched, check out our list of top PC sandbox games. According to Leisurewear, this follows someone at either Take-Two or Rockstar getting in contact with the .White team and ordering them to shut down production of the mod immediately. With Red Dead Redemption 2 coming out this autumn, I imagine neither Take Two nor Rockstar wanted attention taken away from their forthcoming release. 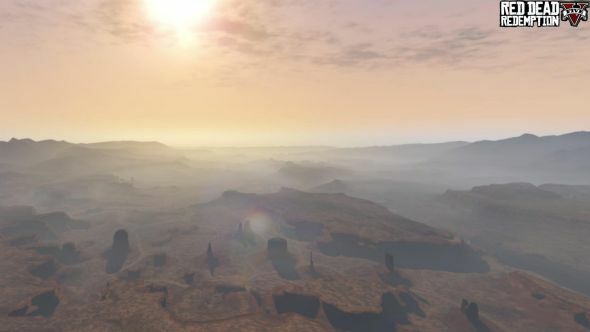 While other extensive GTA V mods like the recreation of Liberty City have been spared the wrath of a takedown notice, this Red Dead Redemption map mod must have cross too many boundaries for Take-Two and Rockstar’s liking. .White are the people behind the mod. So far all we can see of it are two – admittedly quite impressive – screenshots, but .White promise a teaser trailer “coming soon”, and a beta release “sometime this summer”. The announcement and an FAQ are available here on the GTA forums. The .White team say their “goal is to bring you the full map with additional content which will be unveiled later on”, so it’s not clear yet what we can expect in terms of actual gameplay. They do say they will add support for third-party multiplayer clients (specifically mentioning FiveM and FiveReborn), so hopefully we’ll be able to approximately recreate Red Dead Redemption’s excellent multiplayer mode. In the meantime, we can technically already play Red Dead Redemption on PC, but only via Sony’s subscription service PlayStation Now.